“In a hyperpolarized environment in which we effectively have a bipolar Congress with no middle, there are just much smaller returns to being in government,” he said during an interview with The Atlantic ’s Steve Clemons on Wednesday. Because of this, smart people working in business see less appeal in taking a pay cut and moving to Washington. “What would excite many of the people I know about being in government would be the opportunity to actually do things, rather than just lob grenades at each other,” he said. Those who have stuck with their government jobs aren’t very happy about it. Orszag cited a new study published by the Partnership for Public Service (of which he is a board member), which reports dismal public employee job satisfaction levels: On average, government employees reported a 57.8 percent satisfaction rate, compared to a 70.7 percent satisfaction rate in the private sector. In particular, government employees hate their bosses. On average, people reported a 51.8 percent satisfaction level with their senior leaders, and this agency-by-agency breakdown indicates that there’s some pretty harsh boss-hate in certain government offices (my heart goes out to you, Financial Crimes Enforcement Network leaders: a 22.5 percent approval rating has got to hurt). Top agency leaders just aren’t that good, Orszag argued, and government jobs aren’t appealing to the top workers in other sectors. “We are at significant risk over the next 20 years of a dearth of leadership in the senior agency level, which is necessary regardless of whether you’re a Republican or Democrat,” he said. 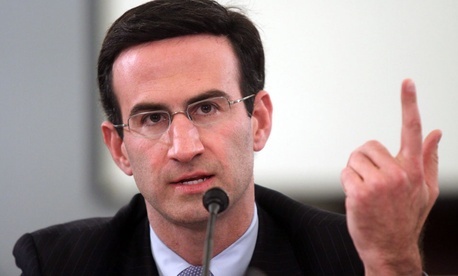 Poor performance by certain agency leaders is aggravated by what Orszag described as a general aversion to risk. Any truth in stereotypes about government work—slow moving, bureaucratic, unoriginal—is the result of a few factors, Orszag said. Intense political divisions among elected officials don’t help. “If you don’t think anything is going to happen anyway, why be bold? If you’re stuck in a world of polarization and bimodal Congress and nothing’s possible, your incentives are to just kind of sit tight and hope nothing bad happens,” he said.